A section of Kuhio Highway in Kilauea, Kauai, that floodwaters overran was still limited yesterday to one lane of traffic. Heavy rains returned to hard-hit Kauai again yesterday, closing roads and making conditions difficult for searchers trying to find five people still missing from the Ka Loko Dam break. "It's coming down at a pretty good clip," Maj. Gen. Robert Lee, head of the Hawaii National Guard, said at a news conference yesterday. A flash flood warning was in effect for much of the island yesterday, but no major flooding or evacuations were reported. The National Weather Service predicts the threat of heavy thundershowers will stick around through tomorrow for Kauai and Oahu. Officials say the heavy rains have slowed searchers, who have been going through piles of tree limbs, pieces of two homes and other debris that were swept away by a wall of water from Ka Loko Reservoir on Tuesday. The ground search yesterday was concentrated on three large debris piles along Wailapa Stream. 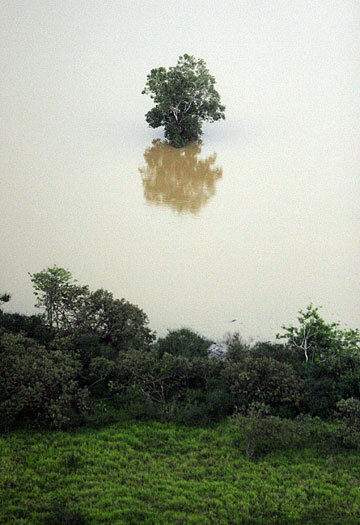 A tree was surrounded yesterday by water in Waita Reservoir, a testament to the amount of water in the reservoirs. Searchers used heavy equipment to comb through the piles, one of which was about 100 feet long, 30 feet wide and 30 feet tall. "It's kind of like the game of pixie sticks," Kauai Fire Department Chief Robert Westerman said. "As you try to separate them, it's kind of difficult." Meanwhile, divers have started to search murky waters for the missing. They have found a car so far but did not find a body inside. Lee said he plans to send 10 National Guard members to Kauai this week to relieve search teams, who have been sent in from around the state. He has also doubled the National Guard presence on Kauai to 45 soldiers, some of whom have been watching several at-risk dams. The reservists will soon have help from electronic monitoring devices, which will be installed by the U.S. Geological Survey at several dams. State Department of Land and Natural Resources Director Peter Young said yesterday that dams destined for the equipment have not yet been chosen, pending an aerial inspection. The devices will remain for a month and alert civil defense officials if water levels are too high. Despite yesterday's heavy rains, water levels at Morita Dam and Waita Dam, both of which officials are watching closely, remained safe, Lee said. But the showers quashed plans to open a disaster recovery center in Kilauea this weekend, where residents could apply for federal aid. Lee said officials now want to open two disaster centers sometime this week, once the weather lets up -- one in Kilauea and a second in Kaloa, where major flooding was reported. ON FRIDAY, the Kauai County Council met to pass a $1 million emergency budget request to pay for disaster relief efforts. The funds are being used to rent pumps, trucks and other equipment to deal with the disaster. 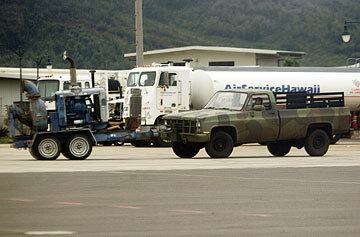 A pump delivered by a National Guard C-17 yesterday, shown at left, was moved on the tarmac of Lihue Airport on Kauai. The money does not include overtime costs, Kauai Mayor Bryan Baptiste said, adding the county is just beginning to assess damage from the flood. He said rain may slow those efforts. The continued showers may also interfere with plans to assess whether damage on Kauai and Oahu from nearly four weeks of heavy rain qualifies for a federal disaster declaration, which could bring in more federal money and programs. Already, farmers and businesses are eligible for federal funds, along with some homeowners. And state Transportation Director Rod Haraga also said repairs to Kuhio Highway in Kilauea, where a portion of the roadway was damaged by floodwaters, are expected to be reimbursed with federal funds. 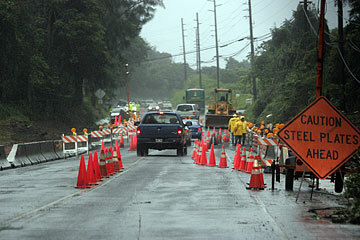 On Kauai yesterday, flooding again closed the Kapaa Bypass Road about noon. The road had re-opened briefly after flooding closed it Friday. KEALIA, Kauai » County lifeguards said there were two shark sightings yesterday in the vicinity of Kealia Beach and have posted "beach closed" signs in the area. But that didn't stop about a half dozen surfers from surfing the chest high waves in the muddy, brown water about noon yesterday. Kealia this weekend was supposed to be the site of a Hawaii Surfing Federation contest, which was postponed. State Department of Land and Natural Resources Director Peter Young said yesterday that sharks are often attracted to muddy waters. He urged residents to stay out of the ocean. Also, Kauai Fire Chief Robert "Bob" Westerman pointed out that county beaches are currently being staffed with only one lifeguard at each tower so that other lifeguards can assist with emergency efforts in the wake of the Ka Loko Dam break. » The USS Lake Erie is anchored off Kauai and is using its pumps to help drain water around Kekaha. » A National Guard C-17 flew in two pumps from Maui along with road work signs. » Pumps are set up at several spots on Kauai to remove floodwaters, including at Kapaa Bypass Road.